Sudden onset of winter at lake Spitzingsee! 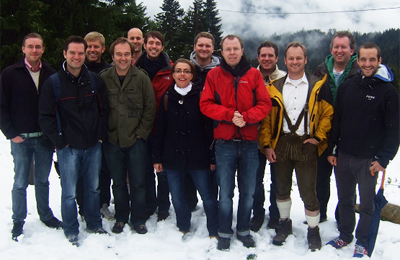 In late September, the department for "Industrial Organization and New Technologies" of the Ifo Institute and the ISTO met for a joint research seminar at lake Spitzingsee in the Bavarian Alps. The two-day seminar allowed the academics to give a presentation about a research topic and to lead a discussion about it afterwards. Surprised by the sudden onset of winter, and cut off from the outside world due to heavy snowfall, the participants were able to focus completely on the scientific objectives.